It was yesterday March 22, 2013, when for the first time with emotion and difficulty the first BeBeez article was published. The first article arrived at the end of a fantastic journey, it was the first moment of a different professional life for me, but above all the first step on a road that would have led to the realization of an even more beautiful dream, which sees the light today. Many people have helped me, supported and have been important for me in these years … it was a short but important moment of life, among friends, of great personal and professional union. Among those people I can not forget to thank Anna (Gervasoni), Gabriele (Capolino) and later Fabio (Allegreni), Lorenza (Spriano), Antonella (Negri-Clementi), Roberto (Spada), my partners and above all friends, all, in different moments, they supported me, helped, stimulated and advised to get to where we arrived. But I want to say thank you also to all the sponsors who have supported me since the first moment and who have always followed me and have allowed me to realize different, new services, from BeBeez Caffé to the last born, BeBeez Private Data. I am still amazed at the thought that FSI has decided to support my database when it was still just an idea and I thank Maurizio (Tamagnini) for this. But even for BeBeez it was like that. I only started with an idea and I found someone who trusted me only on the basis of that idea. All this, day after day, happens thanks to those who work with me, to Giuseppe (Michelucci), to Salvatore (Bruno), but most of all to Giuliano (Castagneto) truly irreplaceable for me. But thank you I also say to those who bear my MacBook pro on at all hours, to Brando (my son, a wonderful digital native teenager) and to Andrea (my husband, who is a bit ‘jealous of BeBeez, without him I do not know if I would have been here now). 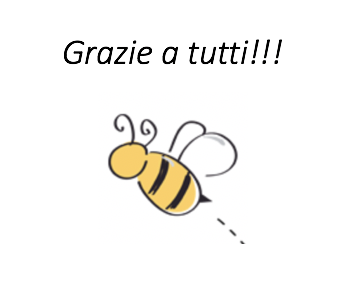 Finally, thanks to you readers, who have given meaning to all this effort, which gives value every day to BeBeez. You are, we are, in 5,000, everyday reading, commenting, living BeBeez. And it’s not over here … soon there will be other big news. But in the meantime I’m waiting for you all to test BeBeez Private Data, to read the new BeBeez reports and the Insight Views and to consult the cards of the companies in the fund portfolio, a taste of what you’ll find in BeBeez Private Data.